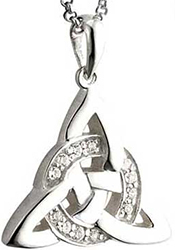 The use of Celtic knots and designs in jewelry dates as far back as the 5th century BC as evidenced by torques that have been found by archaeologists. These ornate torques with their unending lines were worn around the neck of nobles and warriors who believed that energy from the jewelry would be transferred to the wearer and subsequently it would act to ward off evil. Additionally the suspected vitality of the torque was considered another layer of protection in battle. 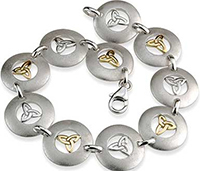 The ancient Celts believed that the particular metal of the object held significance and related silver to the moon and gold to the sun: those with less affluence and influence has to settle for the more common and relatively accessible bronze or iron for their jewelry construction. In due course these torques evolved into Celtic bracelets and the interlaced and uninterrupted lines that decorated the jewelry became more elaborate. By the time the Book of Kells, a opulently decorated manuscript containing the four Gospels of the New Testament, was written in the 8th century AD, Celtic designs had undergone a brilliant transformation that is demonstrated in the animated illustrations and complex embellishments of the treasured book. 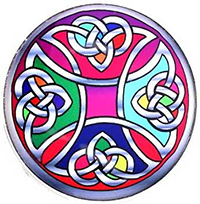 Today you will find these elaborate designs in the Book of Kells jewelry. Dating back 5,000 years to the stone age, Newgrange, a temple with large passage tomb, was built in Co. Meath, Ireland by the local farming community. Very deliberately, the passage and chamber are aligned with the rising sun at the Winter Solstice thus celebrating the renaissance of the sun after the shortest day of the year. Many of the megaliths that surround Newgrange are decorated with carved art with the most impressive and recognizable being the entrance stone which is engraved with the tri spiral design that is often found on Newgrange jewelry. knots, to be worn as ornamentation and jewelry. Today it is common to find the icon as tattoos and as Tree of Life necklaces and earrings. The monolith Celtic crosses that dot the Irish landscape are some of the most recognizable icons of early Christianity in Ireland. Many of these monuments, including Cross of Scriptures at Clonmacnoise, are decorated with ornate figure carving and detailed knot work with the principal characteristic being the circle connecting the arms. 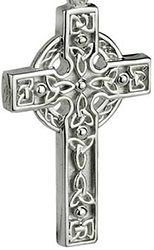 As a sign of faith, Christians are often encouraged to wear a cross around their neck so it is very understandable that the Celtic cross necklace would become the symbol of choice for those of Irish and Scottish heritage. that was buried in a sandy beach. 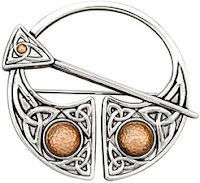 Purely for marketing purposes the brooch was named after the Hill of Tara that is traditionally accepted as the seat of the High Kings of Ireland. The Tara brooch was made circa 700 AD and illustrates the highly developed craft of goldsmithing in early Ireland. The much copied Tara brooch now resides at the National Museum and is regarded as one of Ireland's ancient treasures. Through their continuous lines the knot and spiral designs in Celtic jewelry symbolizes the wealth and clarity of the ancient Celts. 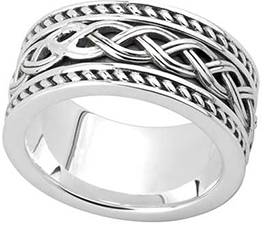 One of the primary symbolisms of the unending Celtic knot is the representation of endless love so the designs have easily been equated to marriage and thus the popularity of Celtic knot wedding bands. 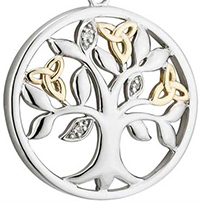 The Irish Gift House is proud to offer a full range of jewelry that includes Celtic necklaces and Celtic earrings that is completely made in Ireland.